There are milestones in life that require a fancy steak. Or at least the kind of place where one can get a fancy steak. If you’re in the midst of such an occasion, Peninsula Grill has got you covered. I jest, but the pressure got to me, and I took a five-pound slice to go. During the ensuing sugar delirium, I concluded the hype may be true: Every time a gargantuan slice of coconut cake ($11) is consumed, an angel gets its wings. Or something like that. On the tastebud front, Peninsula’s coconut cake continues to be a dense butter/sugar sunshine daydream with five layers of cake sandwiched between rich icing and toasted coconut. I don’t know if it’s copyrighted or patented or what the guy specifically said, but that cake is definitely deserving of its own zip code. Meanwhile, the seared foie gras ($25) is deserving of a modeling contract. The perfectly cooked slice of delicate liver rests atop artful smears of cinnamon-infused strawberry coulis and aged balsamic reduction. 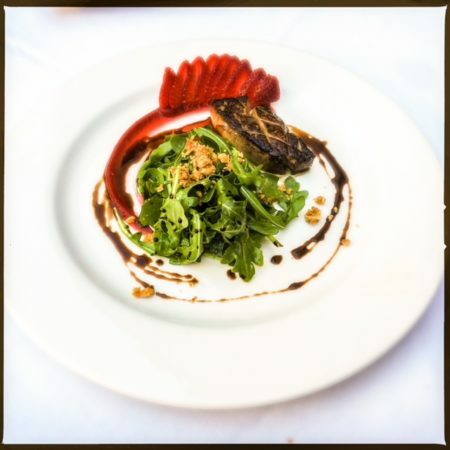 Backed by a vibrant fence of fresh strawberry slices and a crisp arugula salad, this is about as good as foie gras gets. The she crab soup ($12) is another of the restaurant’s traditions, most of which seem unchanged despite the arrival of new executive chef Ramon Taimanglo. 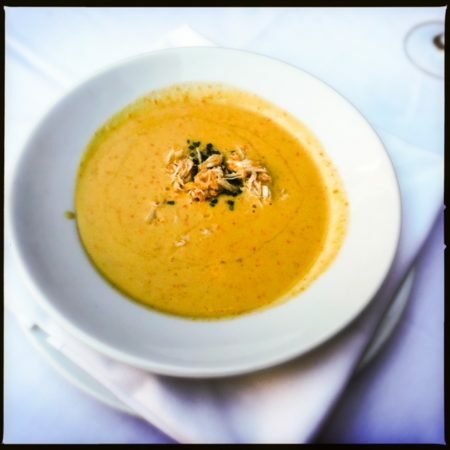 Topped with a generous portion of fresh blue crab, the bisque itself is thick and rather sweet. Upon closer examination, the soup is seemingly chockablock with bits of ground carrot, perhaps subbing for crab roe and decidedly providing some sweet notes. Infused with a bit of sherry, it’s a decadent and satisfying bowl. Service is mostly unobtrusive and effortlessly polished. A few of the runners get a touch grabby in their zeal to clean up, but it’s not enough to detract. Meanwhile, note that the celebratory steaks are a la carte, and a 16-ounce ribeye will set you back $47. Nonetheless, it’s a quality cut of meat, cooked to order and with a precisely seasoned crust. Should you order an accompanying side of Vidalia whipped potatoes ($8), prepare for disappointment. The surprisingly small scoop somehow manages to perfectly recreate the look and taste of reconstituted potato flakes. Factor in the tempura-battered onion ring positioned upright on top in a (probably unintentionally) amusing manner, and it feels more like a mess hall than a high-end restaurant. The side of cauliflower with almond crumb ($8) fares better, with a generous portion of roasted cauliflower plated to overflowing in a small casserole dish. Although several pieces range from crunchy to disagreeably raw, the savory nut topping tips the scales and renders the dish ultimately enjoyable. 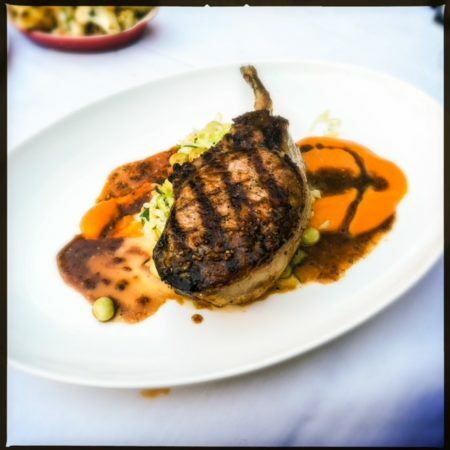 Similarly, the grilled bone-in pork chop ($36) is expertly prepared. The gigantic tomahawk is plated on two swirls of airy sweet potato puree and garlicky whole grain mustard jus. 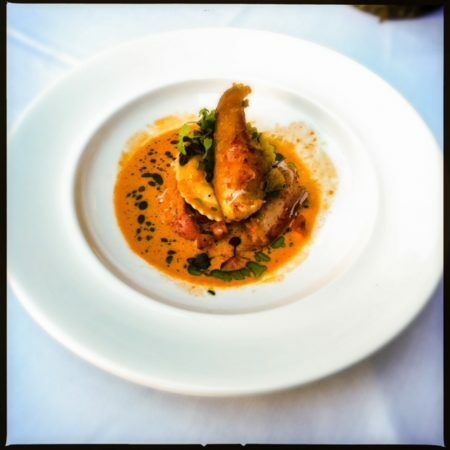 The puree has light spice notes reminiscent of garam masala, and pairs nicely with the unctuous savoy cabbage and butterbeans. Rich with actual butter, the combined flavors mix magically with the thick, juicy chop in a truly masterful manner. 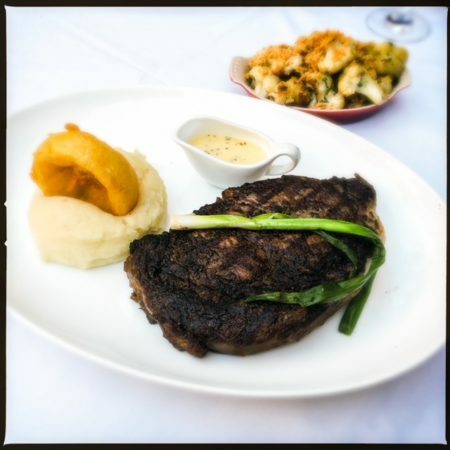 A celebratory destination for over 21 years, Peninsula Grill is much the same as it ever was. With an entryway decorated with magazine covers confirming its long, illustrious history, there are still some pitfalls in the generally extravagant menu. All the same, if a large steak cooked to order is what your occasion requires and you’ve got a few Benjamins burning a hole in your pocket, it’s probably hard to do much better.